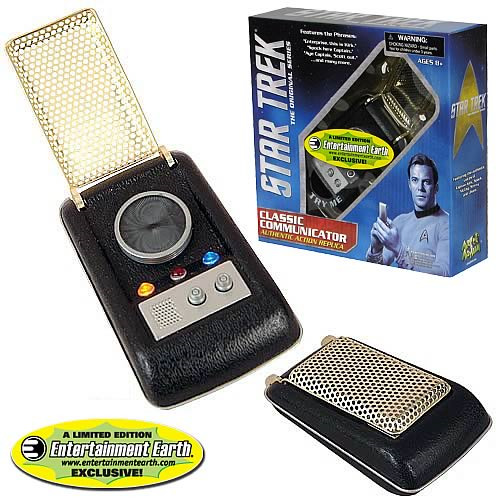 This life-size Star Trek Original Series Communicator talks! An authentic, limited edition, collectible replica. Just like the prop, only better! Beeps sounds and speaks 9 phrases from the sci-fi TV show. Can be configured to "call you back"! "Transporter room ready to beam up." Cycle through all 9 phrases! To play all the sayings from Kirk, Spock, Scotty, and Uhura, just press and hold the button under the blue light for 3 seconds. Be hailed by the Enterprise! Hold down the button under the red light for 5 seconds, and quickly close the communicator. A few seconds later, your communicator will start to beep and once you open it, Spock will ask if he can beam down an armed landing party. Quick flip-open activation! A motor inside the communicator will start spinning and an activation sequence will play when you flip open the plastic gold communicator lid. NOTE: For full enjoyment of this product, please take note to remove the plastic tab inserted on the communicator's side. The communicator's full functionality is activated only when the item is opened and the tab is removed.